Research & Awards – Kris Erickson, Ph.D. Broadly, I engage in critical research that interrogates the relationships between digital technologies, media, culture, globalization, environment, and urban mobilities and spatial practices. Specifically, I am interested in how digital technologies and open data are increasingly deployed within the contexts of the public sphere, urban planning, and sustainability. I seek to analyze the (often unequal) power structures that subtend and inflect the “digital,” “cyber,” and “smart” city, particularly as these power relationships connect to the meaning of the contemporary city and mobilize discourses of urban sustainability, digitalized security and safety, and democracy. 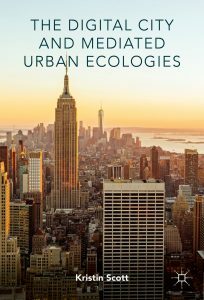 In my book, The Digital City and Mediated Urban Ecologies, I examine the digital technological initiatives and programs of three major cities in the U.S. (New York City, Seattle, and San Antonio) and how each city’s government deploys terms such as “digital,” “smart,” and “cyber” to describe its urban digital technological goals. Historically, both cities and digital spaces have held a unique place within the cultural imaginary. As major urban centers and digital spaces are comprised of demographically diverse, pluralized cultures, both have become ideal—and often idealized—spaces for inter-class contact and myriad, though sometimes competing, formulations of community that, at least ideologically, promise autonomy, progress, and social, economic and cultural opportunities and enrichment. In my analysis of these three cities, I argue that many of these programs, in practice, often work to reinforce existing hierarchical power relations. In the summer 2012, I also was accepted into and funded to attend a highly competitive professional summer school session entitled, “Spaces of Media,” at Princeton University, in collaboration with the Bauhaus-Universität Weimar, Internationales Kolleg für Kulturtechnikforschung und Medienphilosophie, in Weimar, Germany. The Princeton Weimar Summer School for Media Studies offered advanced collaborative learning opportunities in the study of media and mediated cultural techniques. Focusing on one special topic annually, the school accepts a small group of graduate students to work intimately with prominent international scholars from all fields of media studies, providing a platform for participants to engage in dialogue with other doctoral students from around the world working in similar or related fields. 2014: Applied Urban Communication Research Grant, from Urban Communication Foundation to support fieldwork in Copenhagen, Denmark for my research project, “Danish Smart Cities: Mobile Solutions for Urban Sustainability,” which explores the use of mobile technologies in digitally sustainable smart and intelligent cities. 2013: Distance Education Course Development Grant, from George Mason University to support the creation of a distance education senior capstone research class for the Bachelor of Individualized Studies program at Mason. 2012: Princeton-Weimar Summer School for Media Studies. “Spaces of Media,” Princeton University, Princeton, NJ. and the Bauhaus-Universität Weimar, Internationales Kolleg für Kulturtechnikforschung und Medienphilosophie, Weimar, Germany. 2006: Carnegie Academy for the Scholarship of Teaching and Learning (CASTL) Institute Scholarship Recipient, Carnegie Foundation for the Advancement of Teaching.